Cottage in Uldale, Near Keswick, Lake District, Cumbria, England - Pub With Restaurant, Tea Room/Art Gallery And Playground In The Village, Walks From The Door. Emerald Bank Cottage is situated in the most spectacular northern part of the Lake District. 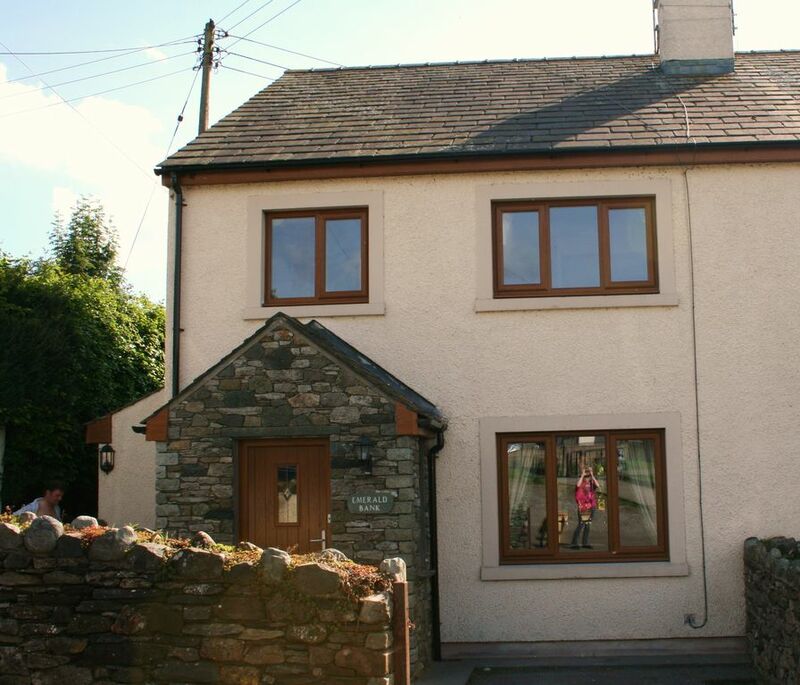 It looks like a traditional lakeland cottage but has every modern appliance, with everything you’ll need for a walking or family holiday in the Lake District - including maps, walking books, boot racks, dog basket/bowls and a games room with table football and air hockey. The cottage is situated in Uldale, a small rural village in the Lake District National Park between Bassenthwaite Lake and Caldbeck. The village has a tea room, tennis court and adventure playground and the Snooty Fox Inn - serving a variety of real ales and superb food. This part of Cumbria is beautiful and quiet, excellent for walking away from the crowds. There are walks straight from the door, with sightings of birds of prey and red squirrels commonplace. The lakes of Bassenthwaite, Buttermere, Crummock, Derwent, Ullswater, Loweswater, Ennerdale are a short drive away. Keswick or Cockermouth are 15 mins away. We are Kay and Mike Wesley. We live in Cheshire and we have five children and a dog. We all love the great outdoors, walking, picnicking and just messing about in the countryside. We like the Highlands of Scotland and the Lake District best. We have been to the cottage lots and it is a really lovely place to just hang out, somehow seems really easy to be there and everyone is always in a good mood. Several family members have also been with gangs of friends too, which is great, and lots of friends' families have stayed. Everyone loves it and wants to come back again. So do we! We chose Emerald Bank Cottage because it is in our favourite part of the Lakes 'where the crowds don't go' and the scenery here is breathtaking, without any litter, noise or traffic. The northern Lakes are just fabulous. I think our favourite is possibly Loweswater, which hardly anyone visits, but is just lovely and a nice 5 miles round to walk with woodland and fell included in the walk. Follow it up with Steak and Ale Pie at the Kirkstile Inn and their own brewed beer. Lovely Buttermere is beautiful with a flat 4-mile walk round and also with a couple of good pubs for lunch at one end. Crummock Water is also fantastic and very quiet, with a lovely walk through the woods at the north end. We've tried to think of everything we have ever wanted on all the many self-catering holidays we have been on. People remark on how well-equipped it is, from plenty of wine glasses to the iPod dock. And everyone loves the games room for evening competitions! We know how annoying it is when there is nowhere to hang your wet cagoule so we had the utility room extended to include a drying area with hooks above a big radiator, and boot racks too. We included a dog basket and dog bowls, and even bird feeders in the garden. We've added a hose in the side yard to wash your muddy boots and dog. We've included Ordinance Survey Maps of the whole Lake District as well as a number of good walking books. Our approach has worked, everyone loves staying here as much as we do - hope you do, too! Lounge with TV, DVD player DAB/iPod dock/USB stereo Dining room with games, walking books and walking maps of all Cumbria including a map with Emerald Bank Cottage at its centre. Lovely stay in a lovely quiet part of the lakes. (Although early morning cows (6am) were a little bit of a surprise. Great walks at the back of Skiddaw. Highly recommend and would love to go back! Tracey, thank you so much for your kind comments. We would certainly love to have you back again in the future! Kay and Mike. BEAUTIFUL CLEAN AND TIDY COTTAGE FOR A THREE NIGHT FAMILY STAY. THE WEATHER WAS AMAZING. WE CLIMBED HELVELLYN IN THE BEST WEATHER FROM ULSTER STARTING THE DAY OFF AT 28 DEGREED C FINISHING OFF AT THE TOP IN ICE AND SNOW. AMAZING VIEWS OVER MOST OF THE LAKES. WE WALKED AROUND SOME OF ULSTER AND CAME BACK BY THE STEAMER. WE SPENT TIME IN KESWICK WALKING BY DERWENTWATER. RECOMMEND THE VISITOR CENTRE ON THE BORROWDALE SIDE OF KEWSICK FOR A SPOT OF LUNCH. Six of us (family) and small dog stayed in this beautiful home from home accommodation for three nights. We had the most amazing weather for middle of April. There was everything a family needed and everything for dog including a basket, bowls etc. A lot of thought has gone into this beautiful home. We were made to feel most welcome. We had extra family join us for a day and I was able to cater for them with the ample pots etc. The games room was a hit with the kids and their Dad!. Well thought out for all members to enjoy. Thank you. We had a great stay, the property was a great size for 2 families with 2 small dogs. The games tables kept the kids entertained and there was everything we needed, it was just like home. The pub was just down the road and the food was good. Would recommend. Great place, ideal for us. We'll be back all being well. House well appointed with everything we needed. Good to have maps available for our use. Excellent pub just a stone's throw away. Walking books and OS walking maps provided. Boot racks and kagoule drying area. Coast 16 miles, with long flat beaches between Silloth and Maryport. Car hire recommended. Manchester Airport 124 miles, Glasgow Airport 120 miles. From Emerald Bank Cottage you can walk up the famous Skiddaw, one of the highest mountains in the North Lakes. There are many more waymarked walks in the local area, including a section of the Cumbria Way. The lovely village of Caldbeck is just a few miles away and has some excellent country pubs. Ireby, the neighbouring village to Uldale, has a folk festival in May. The city of Carlilse with restaurants, nightlife and cinemas is about 19 miles/30 minutes' drive away. Booking Notes: Please call or text: 07711 459740 or email. Changeover Day: Friday - flexible. Summer 2014 (from 5th July to 7th September) is Saturday changeover Notes on prices: Short breaks of 3 nights+ available - please enquire.